An LGBT pride parade in St Petersburg, 2014. Photo CC BY-NC-ND 2.0: Maria Komarova / Flickr. Some rights reserved. It’s become a tradition across the globe to celebrate LGBT Pride in the last days of June. Usually, such events are held on the weekend closest to the 28 June, as it was on that day that the modern LGBT movement in the USA began in earnest. It was an initiative that inspired strategies and tactics of human rights advocacy in many other countries. Although it takes different forms across the world, LGBT pride raises issues of freedom of expression, human rights, and healthcare for LGBT people. In some cities Europe and the USA it has turned into something of a commercial event or cultural festival for the wider public. In other locations, LGBT people march under the threat of police brutality. In Russia, the first LGBT pride march was held in 1991 on the square before Moscow’s Bolshoi theatre as part of the Soviet Union’s first LGBT festival. The more modern history of LGBT parades in Russia began in 2006 when LGBT activist Nikolay Alekseyev attempted to officially organise a pride march in Moscow. Years passed, and the city authorities still haven’t found the guts to permit a march for LGBT human rights through the capital’s streets and provide security for its participants. However, other banned marches have been successfully challenged in the European Court for Human Rights and Alekseyev has generated support in other regions of the country. He and his colleagues have applied for permission to hold pride marches in Blagoveshchensk, Cherkessk, Cherepovets, Kazan, and Nizhny Tagil among many other cities across Russia, though they have always been rejected and sued city governments in response. A notable exception came in 2013, when the governor of St Petersburg did not forbid the city’s LGBT pride parade, although it did encounter violently homophobic protesters who tried to obstruct the march. In fact, these violent far-right groups keep close tabs on LGBT activists in Russia and the events they hold – or try to. While the government fights some homophobic campaigners and inciters of hatred, it supports others. After all, instigating violence against LGBT people is essentially the Russian state’s official policy towards sexuality. For example, the 2013 law banning “propaganda” of “non-traditional sexual orientations” sparked a wave of hatred against LGBT people across the country. As we discovered from court decisions last year, after the “propaganda” bill was signed into law, the number of hate crimes against lesbians and gay men doubled. In 2012, we found 33 examples of such hate crimes, while 2013 saw 50 hate crimes against LGBT citizens. By 2015 there were 65. 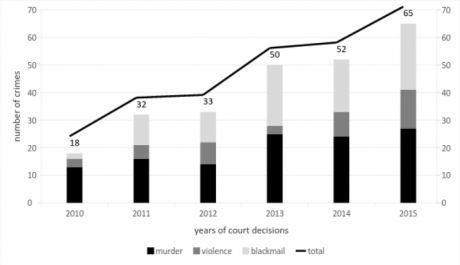 We registered not only a common rise of LGBT hate crimes, but also the rise of homicides: following the enactment of the “propaganda” bill, there were more and more murders of people simply for being LGBT. The growth in hate crimes against LGBT people across Russia. Image courtesy of the authors. Of course, these are only the recorded crimes – many LGBT people may not dare approach the authorities after harassment, humiliation, or worse. These data are based on official court statistics, though we had to dig through the results ourselves. 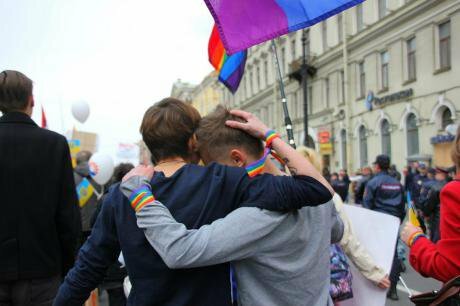 Nobody officially collects information on violence against LGBT people in Russia. On the contrary, the authorities pretend that nothing is happening. This attitude sometimes reaches absurd extremes when government officials claim that LGBT citizens simply do not exist. After facts came to light about the systematic torture of gay men at secret detention camps in Chechnya, the republic’s press secretary immediately retorted that “you cannot repress those who are not and cannot be here in the Chechen Republic.” Despite the justified focus on Chechnya, these claims are hardly specific to one culture or region within the Russian Federation – officials in other regions speak in much the same manner. For example, the mayor of Svetogorsk in Leningrad Region declared his city “free from gays.” He subsequently argued that LGBT issues and rights are irrelevant there, neither an LGBT community nor LGBT people exist in the small city. This imagined absence of LGBT people constitutes an active policy of silencing and excluding some citizens from the wider national community on the grounds of their sexuality. These comments certainly reinforce existing prejudices and reproduce violence against vulnerable groups. But what is the real picture? Let’s say that the authorities of a Russian city actually permitted an LGBT march to go ahead? Would these violent protectors of a false morality then take to the streets to fight those marching, to stop their fellow citizens expressing their point of view and standing up for their rights? It depends on where you are. In other words, how dangerous is it to be gay in different Russian cities? Media doesn’t simply inform society about current affairs; it also provides frames for understanding social problems, rendering some topics more important than others by virtue of generating discussion around them. Violence against LGBT people may be a key cause for concern in the human rights movement, but that urgency is lost in public discussions. But media can also remedy societies from oblivion by sharing stories which are otherwise forgotten or ignored, and spark positive change. For example, the murder of gay teen Matthew Sheppard was one of the most publicised hate crimes in the US history. The furore in the press eventually led to changes in hate crime law. One of the effects of Russia’s “propaganda” law was not simply the rise in violence against LGBT people. It also led to more frequent ewspaper publications on LGBT topics, hence public discussion on a topic which still remains taboo for many people. This was not entirely what legislators intended. We benefitted from this situation by researching the details and contexts of violence against LGBT in Russia as they were reported in media. The Sexuality Lab studied almost 4,500 media publications about violence against LGBT people in Russia between 2011 and 2016. We categorised all newspaper articles in accordance with the sexuality of the victims reported and the locations of crimes committed. All cities were then classified by population, making it possible for us to calculate an index of safety for every urban settlement. The data reveal that the most dangerous places for LGBT people are villages in the countryside and small towns with a population below 100,000: they are characterised by the highest rates of violence against LGBT people per 1,000 persons. The safest locations are the largest cities (Moscow and St Petersburg): despite the greater number of crimes against LGBT in these cities, their relative indexes are actually the lowest. This can be explained by understanding the circumstances of these hate crimes. Very often, hate crimes are committed as soon as perpetrators learn about the victim’s sexuality, which is usually revealed in a conversation in a private space over a drink or meal. These social gatherings occur more frequently in smaller settlements, because that way of life is simply more common there: there are fewer bars to go to, fewer crowds to blend into, and more free time to kill. People drink alcohol and talk about their personal lives as there’s no other way to spend one’s spare time. Alhough many people in Russia actually do not give a damn about LGBT issues, some still react violently to a person’s coming out – and such reactions are more common in smaller towns and cities. The graph below shows incidents of violence against LGBT people in different towns and cities of Russia. We compare capital cities, big cities (of 500,000 people and above) and smaller cities (of between 100-500,000 people). This graph shows that the smaller a city, the bigger the probability of violence against LGBT people. Statistically, a gay person is safer in St Petersburg than in a smaller city like Nizhnevartovsk. This could explain why the mayor of Svetlogorsk thinks there are no gay men in his town – anybody with half a mind in that position would leave the place as soon as they felt threatened. Violence and hate crimes against LGBT people across Russia, by city size. Image courtesy of the author. These results aren’t surprising; they just prove once again that homophobia is on the rise in Russia and that hate crimes are supported in its remote regions. We have based our claims on a survey of media publications, which limits the whole picture only to material in the public domain. As a result, there will be many hate crimes which went unreported, and some remote regions not covered in our media survey. However, it is no exaggeration to say that there are parts of the country which are simply not safe for LGBT citizens. One of the ways to protect oneself is to keep silent about one’s sexuality, concealing it from the public in order not to become a victim of violence. So this secrecy around the existence of homosexuals is reinforced not only by political decisions, but also by individual moves as many LGBT people opt to hide their sexuality. While their response contributes to a culture of silence, they cannot and must not be blamed for it – simply put, they fear for their lives. The LGBT pride parades pursue a radically different approach: a public and full-throated political demand to recognise that LGBT people exist. Do our data confirm that Russian cities are not ready to host such events on their territories? If our goal is to fight the silence, the data show exactly the contrary: as long as anybody suffers and is killed because of their sexuality, it is important to shout at the top of our voices to try and stop the murders and political climate in which they are tacitly tolerated. Human rights marches across towns and cities of all sizes are one way of articulating this; a means to make violence visible and demand that it stop.